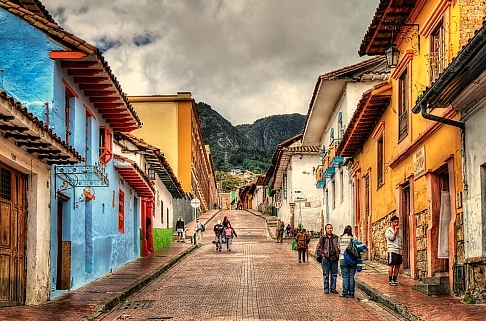 Related to today's price drops from Vancouver to Mexico, there are cheap flights available from Vancouver to Bogota, Colombia for between $418 and $473 CAD roundtrip including taxes. 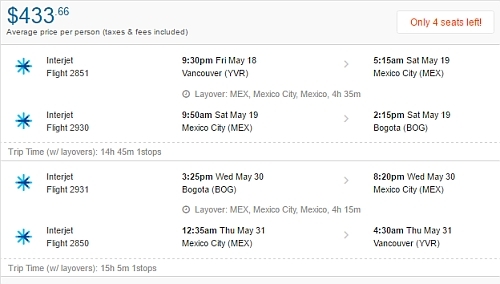 The flights have 1 stop each way, in Mexico City or Cancun. 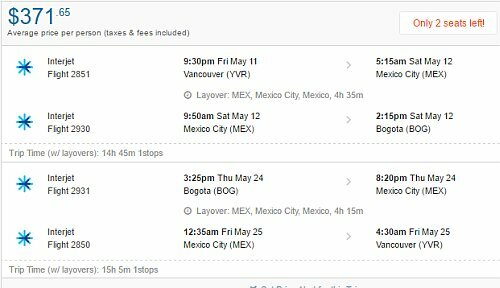 Update 4/4 - Interjet is now showing flights from Vancouver to Bogota, Colombia in May and June 2018 for $407 to $462 CAD roundtrip. - The flights have 1 stop each way, in Mexico City, for 4 hours. May 10 to May 23, 24 -- new! May 17, 18 to May 30, 31 -- new! May 24, 25 to Jun 6, 7 -- new! May 31 to Jun 13 -- new! Jun 1 to Jun 13 -- new! NOTE: Once your Flighthub search completes, the first result at the top may not always be the fastest flights. Look for the flights with about a 4 hour layover each way. 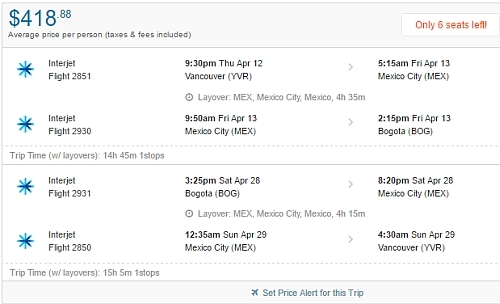 Update 4/18 - Interjet is showing a few flights from Vancouver to Bogota, Colombia in May and June 2018 for $371 to $413 CAD roundtrip. 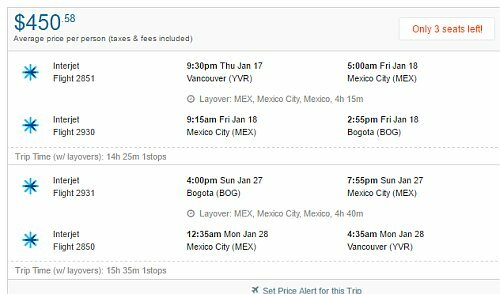 Update 7/13 - Interjet is showing a few flights from Vancouver to Bogota, Colombia in January and February 2019 for $450 to $489 CAD roundtrip.